A New Year's Day bath tub race on the Dorset coast is set to go ahead after the plug was previously pulled, on health and safety grounds. Poole Harbour Commissioners (PHC) said the race could not be permitted as "safety criteria has not been met". But after a "positive" meeting with organisers, it said it was hopeful the event could be sanctioned. Adam Morris from the Blue Boar pub said the support for the event had been "fantastic". On Tuesday, PCH said the event could not take place and action could be taken against anyone responsible for causing an accident, putting debris in the water or creating a navigational infringement. Mr Morris said after an appeal on social media, people had come forward to volunteer as marshals and first-aiders for the popular event. "The public and local businesses have been fantastic and have shown they are willing to support it," he said. In a statement PCH said: "We will work with the event team, over the next two days, with the aim of sanctioning the Bath Tub Race. "It is not our intention to prevent events from happening but we must ensure that there are adequate safety measures and insurances in place... we are happy to do all that we can to assist." 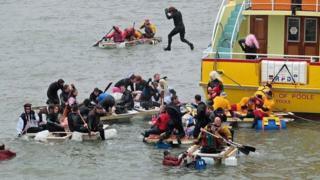 The annual event which has run for 43 years sees teams race in Poole Harbour in homemade crafts made from bath tubs.